For our first March exhibition DVAA is excited to present a group exhibition by architects and artists- Betty F. Bluvshtein, Gabriella D’Angelo, Ryan Drummond, Andrew Hart, Marc Lewis Krawitz, Jordan M Mrazik, John James Pron and Michael Villegas. In his description of 18th century Rome, Giovanni Battista Piranesi (1720-1778) intentionally blurred distinctions between past and present by including the unsettling presence of ancient ruins with scenes of contemporary urban life. 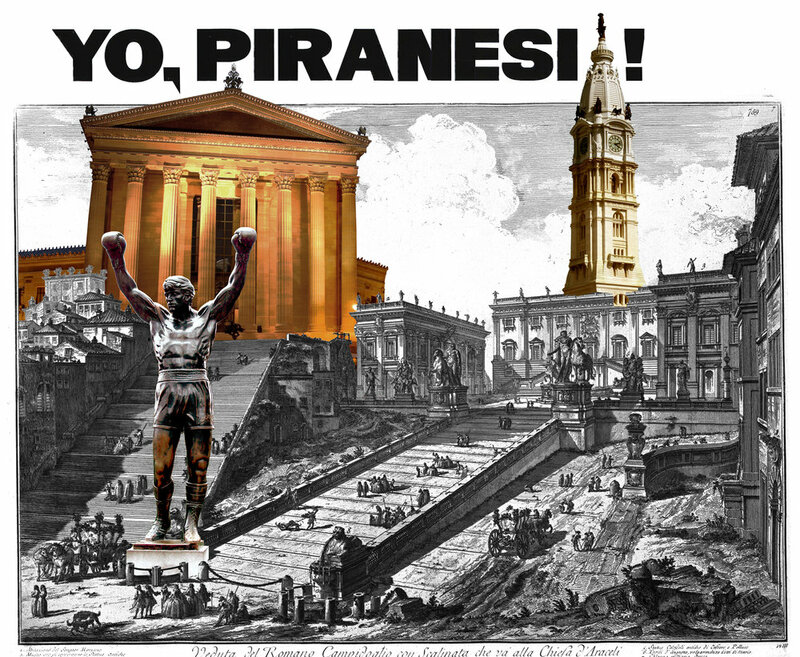 Many years later, when Rocky Balboa ran up the steps of the Philadelphia Museum of Art and turned to face the Parkway, he entered a similar realm, this time one that blurred distinctions between an idealized classical past and a modern automotive present. Inspired by Piranesi’s trans-chronological approach eight artist/architects will investigate his notions for understanding, depicting, and possibly changing 21st century Philadelphia. Gabriella D’Angelo received her M.Arch I from the University of Buffalo and her M.Arch II from the Cooper Union. She is an active designers and Assistant Professor of Architecture at Hobart and William Smith Colleges, NY, where she is continuously experimenting with the formal, material, experiential and construction methodologies in conceiving and evolving architectural technologies. In recent years, her design practice has generated architecture as a tool for social, political and environmental justice, focusing on architecture as agency. www.gabriella-dangelo.com. Ken Jacobs is the linchpin defining the intellectual challenges of this show. He holds a B.Arch from Temple University and a Ph.D from the University of Pennsylvania and teaches history and theory at Temple, Philadelphia University and the Moore College of Art. He is also a preservation architect with 30 years experience in historic research, programming, design and construction administration. Entering the field of architecture to become a strictly “modern” architect, he now concludes that old buildings tell us as much about the present as they do the past. His dissertation focused on Leopold Eidlitz, a 19th century architect who strongly believed in the blend of idealism and pragmatism, of science and art. Can beautiful architectural forms be valued for the knowledge they imparted rather than for the precedent they convey? Ken is asking the participating designers this same question of the etchings of Piranesi. Marc Lewis Krawitz is an architect, designer and educator based in Philadelphia, having received a B.Arch degree from the Department of Architecture, Tyler School of Art, Temple University. In addition to his practice, he teaches architectural representation at Drexel University’s Westphal College of Media Arts and Design. Currently designing for Ballinger Architects, he was previously a collaborator at Austin+Mangold, where he built the winning entry “SuralArk” in Manhattan’s Socrates Sculpture Park. In 2015, he won a state-wide design competition, John Stewardson Memorial Fellowship in Architecture that allowed him to travel extensively in Europe and American, focusing on his investigations of the ‘middle ground’ between architecture, landscape ecology and economy. His research focuses on Representation, specifically the translation from drawing to building. His interest in Piranesi emanates from the precision of the etchings, the process of engraving and printmaking, the transformation of space thru aggregating lines on a page. Ryan Drummond is an architect by profession and training, having completed graduate studies at Cornell University and undergraduate work at Temple University, and he has worked in both Philadelphia and New York City. At Cornell, he studied under Peter Eisenman, Lebbeus Woods and Anthony Vidler- all of whom influence his thinking about architecture’s relationship to representation and disciplinary knowledge. With the sensitivity of a designer, he creates artworks that explore history, architecture, urbanism, art history and literature, and find expression thru drawing and collage. Andrew Hart is a practicing architect and also a Visiting Professor in Philadelphia University’s College of Architecture and the Built Environment. He graduated from Temple University with a B.Arch and from Cornell University with an M.Arch in 2013. He has been a resident of North Philadelphia for 15 years, though he has studied rural Italian architecture, the coal mines of Wilkes-Barre and abandoned villages in Spain. Andrew’s work draws connections between past and present, memory and identity, old and new, digital and analog, while his current studies, built work and research looks to the line between photograph, drawing and model building. He is most often covered in graphite, ink and dust. Michael Villegas is equal parts architect, graphic designer and musician and so he views design as a wholistic practice, engaging diverse mediums, methods and technologies to establish a unique narrative for understanding the world. Graduating Temple University with a B.Arch, he diverged from a traditional entry career to pursue creative projects in songwriting, video production, branding and product design- using each to test his earlier academic research. As a guitarist for Harrisburg-based rock band Minshara, he has recorded with industry producers in DC and Atlanta and has performed on stages from NYC to LA. Additional opportunities have landed him in two episodes of HBO’s House of Cards as well as a guest on the Howard Stern Show. Back in the role of architect, he expects to pull from these parallel experiences to inform his spacemaking and storytelling connecting Piranesi to Philadelphia. An Architecture Lecture by Emeritus Professor John James Pron. He will be speaking about the architecture of Rome, its importance to architects today, the experiences of Temple Rome architecture students and the city’s influence on his own artistic oeuvre. It will conclude with a promotion and introduction to the concurrent “Yo” show. Followed by a reception, and in tandem with an exhibition of his recent Roman gallery shows. Location Architecture Gallery, Room 104 Architecture Building, Temple University.